Welcome to the Royal Cedars and Hidden Meadows Website! Royal Cedars has been breeding quality Nubians at our farm in Dorena, Oregon since 1971. We have bred 30 permanent grand champions, and have produced bucks that have gone on to sire grand champions in other herds. Our herd now resides in the foothills of Junction City, Oregon. Our doe, GCH Royal Cedars SB Sugar Candy 3*M was the 1994 National Grand Champion as well as the 1991 and 1993 Reserve National Grand Champion, the 1993 National Best Udder Winner, and the 1994 Reserve Best Udder Winner. Candy's daughter, Royal Cedars Candy Charisma, sold for $3000 at the 1991 Spotlight Sale. Our 1989 Spotlight Sale consignment, Royal Cedars Plum Passion, was the high-selling Nubian, at $2200. In 2005 we added Toggenburgs to the herd. Karen had always wanted a Togg, and the opportunity came along when an abandoned herd was rescued by a local Oberhasli breeder and needed to find homes for the does. We obtained our foundation doe, GCH Carefree Farms Ambrosia from this herd and have been fortunate to have access to the nationally acclaimed quality sires at Moss-Ridge to breed to. Our small herd of Toggenburgs have really come to bloom, and now make up half of our herd. At our first Linear Appraisal since we've had the Toggs, 4 our of our 10 does we had appraised, scored EX90 or higher. In 2012 when our Toggenburgs were appraised a second time, 7 of our does appraised EX90 or higher, and 2 appraised EX92! In 2011, we added 2 beautiful Lamancha does from the Purple Thistle herd in Moses Lake, Washington. Since then, Purple Thistle has continued to share their excellent genetics and our small herd of Lamancha does has steadily been growing. After Melanie traveled to the 2011 National Show in West Springfield, Massachusettes with two Toggenburg and 2 Nubian milkers, she wanted to become more involved with the ADGA Youth. She traveled to the 2011 ADGA Convention in Grand Rapids, Michigan and achieved her goal of becoming the ADGA Youth Representative! In 2012, one of Max’s Lamanchas was accidentally bred Nubian, resulting in Thin Mint (AKA Munchkin), who he was allowed to keep. Munchkin has been so special, earning her Jr. Leg at her first show. She continued on to win 3 more Jr. Championships in 2012, as well as placing 2nd at the 2012 ADGA National Show in Loveland, Colorado. 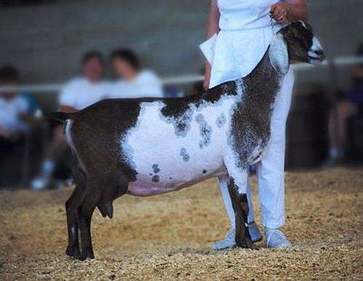 She was also the Best Jr. Doe in Show at the 2012 Oregon State Fair. In 2013 she was one of the 3 does Melanie took with her to the ADGA National Show in St. Paul Minnesota, where she was awarded National Jr. Grand Champion! In 2017 Melanie took ownership of the Hidden Meadows herd name and has since started breeding Saanens.